Thanks to the polar low group at the Norwegian met office in Tromsø for letting us know through BarentsWatch. It might be just me, but I thought this one was particularly beautiful, with prettym uch the whole Norwegian Sea covered by polar lows. This was the third most extreme such outbreak in the period after 1979, at least according to the ERA-Interim reanalysis. 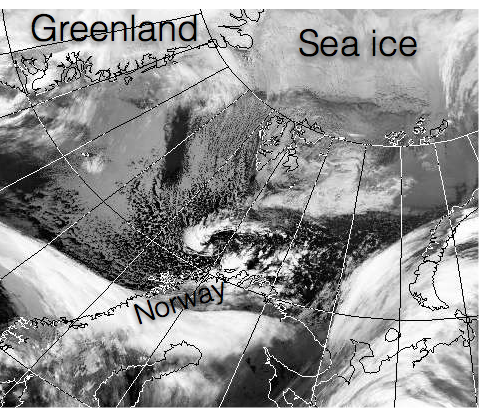 No sea ice north of Svalbard in January is unusual in itself, but a polar low to top it off? That’s pretty amazing. There’s also a new paper out by Elizaveta Zabolotskikh et al. : New areas of polar lows over the Arctic as a result of the decrease in sea ice extent. The title speaks for itself, and their argument is that “new areas of open water appear where mesocyclones can arise”. 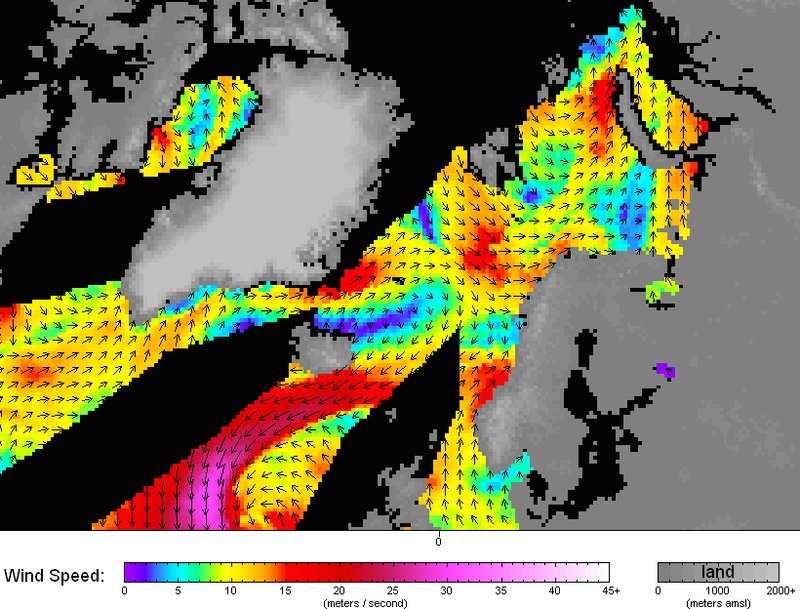 The thing is that polar lows can’t form over sea ice, so when the sea ice retreats, new ocean areas with relatively warm water are exposed to cold air outbreaks, just the environment that is most favourable for polar low formation. One of the consequences is that the Kara Sea (east of Novaya Zemlya) suddenly also becomes prone to polar lows, and this is bad news because this is along the Northern Sea Route (which allows ships to travel from Asia to Europe way faster than through the Suez Canal). There is little doubt that polar lows can form further north than they usually do, and there is also little doubt that this is a portent of things to come. All of these are in the category of cyclones known as “comma clouds”, obviously because they look like inverted commas. As a side-note, maybe they should rather be called “apostrophe clouds”. Anyway, they are what we call baroclinic. That means that the low near the surface is linked to a trough higher up in the atmosphere, and these are not located on top of each other. This vertical structure allows the two lows to work together and to strengthen each other. For more about this interesting mechanism, check out the Norwegian cyclone model, which was developed by the Bergen school of meteorology. Most polar lows start out as baroclinic, but many of the develop a warm core and gradually enter a phase where they go from baroclinic to barotropic. Then the lows aloft and near the surface are locked in phase and no longer help each other grow. For the polar low to intensify in this stage, it needs to get its energy from the warm ocean surface. This is how tropical cyclones (hurricanes) get their energy, too, and some polar lows are in certain ways similar to hurricanes. But so far all the research that has been done on “arctic hurricanes” has shown that the ocean surface is far too cold in the Arctic. In fact, we have a paper in review right now where we look at one such polar low. The tall clouds are “mild” Cumulonimbus clouds forming as the moist, warm air over the sea surface rises in the cold air from the Arctic. 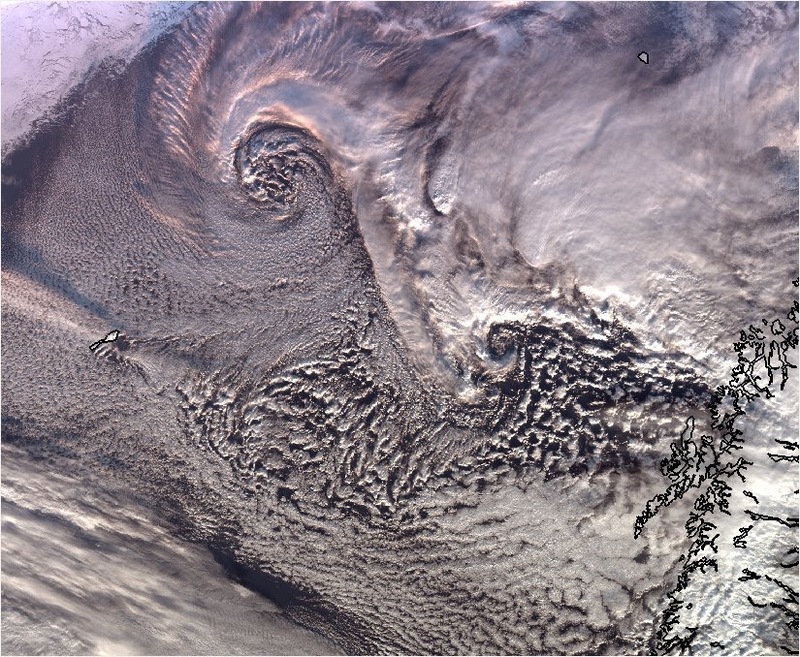 I remember seeing such clouds, albeit more vigorous ones, during the IPY-THORPEX polar low field campaign in Andøya in northern Norway in March 2008. This shows nicely how strong the winds are along the edge of the outbreak. It’s moving slowly, but seems to have built some strength since yesterday. It’s also clear that the polar low formed in a cold air outbreak well north of the well polar front (the region that separates cold air in the north from warm air in the south), which is one of the main characteristics of polar lows. A jet along the sea ice edge just north of Iceland, probably due to the high mountains of Greenland. It’s more common to get jets in northerly flow in this region. The left-side jet off the northern tip of Novaya Zemlya, also due to topography. Left-side jets are normally stronger than right-side jets because flow towards a barrier creates a small-scale high pressure anomaly in front of the barrier, and this strengthens the jet. 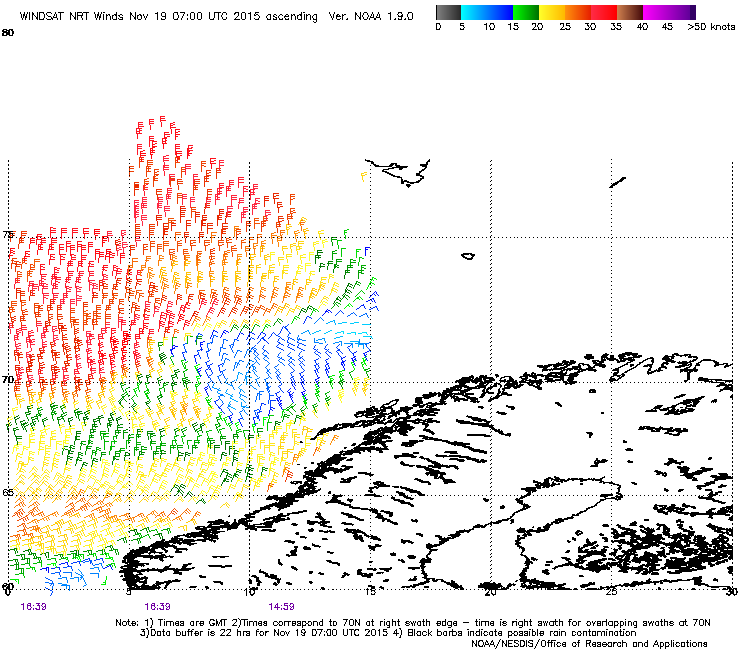 The strong southerly flow along the coast north of southern Norway, also a left-side jet. 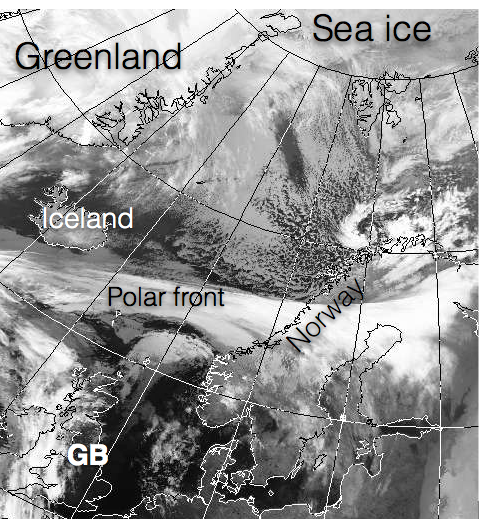 The strong winds along the polar front, which isn’t unusual in any way.